I’m thinking of reorganising my study. Although it’s only a small room this would be a large undertaking. On a practical level it would involve moving eight bookcases together with the eight hundred books that sit on them, a writing bureau and the occasional table that has become the permanent home to my computer. 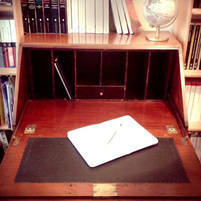 It would also mean shifting numerous folders, notebooks, sheaves of loose paperwork and a copy of my old thesis. As such, it is essential, if I am going to do this, to have a plan. Unfortunately, that’s precisely what I don’t have. I’m not helped by that fact that there aren’t many places to put the furniture in this room. I can’t position anything against the end wall, which is home to both the window and the radiator. The near wall is also largely ruled out by the door. And then there’s the various plug sockets, whose distant locations limit my options still further. I can see I’m going to have to draw a diagram. Could somebody pass the graph paper please? Also, if you’ve got a tape measure, that would be great. But why bother reorganising anything at all? The principal reason is to halt the damage being done to some of my books. The sun passes my study window every morning, shining onto the left hand bookcases for about two hours. The spines of the volumes housed here are now starting to look very faded, despite my Miss Havisham-like efforts to ensure the curtains remained closed at all times. In some extreme cases, the titles have become almost illegible. By swapping these books to the opposite wall I will stop any further damage being done. Or, perhaps, I will simply spread the ill effects more evenly around my collection. Another reason for change is that a newly reorganised study will allow me to think new thoughts. Or at least it might do. By sitting in a new place I will have a new perspective on things, both literally and metaphorically. This isn’t the first time I’ve had a fit of furniture moving. When I was younger I used to change my bedroom around quite often. Sometimes I would sleep with my head at this end of the room and sometimes at that end. I would place my bed first against one wall, then another. And then I’d move the chest of drawers to by the door, or to under the shelf in the corner. To my young eyes it seemed that I was able to transform the space simply by dragging items across the carpet. However, I’m now talking about my study not my bedroom. This isn’t the room in which I simply hang out; it’s the room in which I write. Perhaps I can draw inspiration from other writers, artists and composers. The drive towards biographical explanations of works means that we know a lot about the work rooms of the greats in various cultural fields. We know, for instance, that in Marcel Proust’s case his bedroom was his study. He would write sitting up in bed, swaddled in blankets. We know, too, about Liszt’s sumptuously appointed rooms in The Altenburg during his first tenure in Weimar. And at the other end of the spectrum, we know about the Majorcan cell in which Chopin composed some of his Preludes. None of these famous examples can act as a model for my own study. This room, the small third bedroom in a new build house, cannot be made to take on their aspects. A good job too. It’s important that my writing space be nothing but my own, crafted in my image and filled with my own things. But the problem remains – how to organise them? I’ve had the tape measure out and have made a few quick calculations. I’ve drawn a sketch on my graph paper, to scale of course. And, I think this might just work. I think I can see how all the shelves can be made to fit. There might even be room for an armchair. All that remains is for me to start the move. It’s time, for a short time, to move my study out onto the landing.